From late 2012 through the summer of 2013, four power companies announced the early retirement of five nuclear reactors. In early 2014, the nation’s largest operator of nuclear power plants announced that it, too, is considering early retirements for some of its Midwest reactors. In a new brief, the Center for Climate and Energy Solutions (C2ES) looks at what’s behind these recent announcements, and how a continued loss of nuclear power – a zero-carbon energy source — could make it harder for the United States to meet its climate goals. Since 1990, nuclear power has consistently supplied about one-fifth of U.S. electricity. More importantly from a climate perspective, it has represented the lion’s share — 60 to 70 percent — of all zero-carbon electricity. For the sake of comparison, to replace the power from five nuclear reactors, you’d need 16 (400 MW) natural gas combined cycle power plants, which would emit a total of 12 million metric tons of carbon dioxide per year. If you turned to renewables, you’d need roughly 7,600 (1.5 MW) wind turbines or 3.7 million (5kW) solar PV rooftop panels to generate the same amount of electricity. 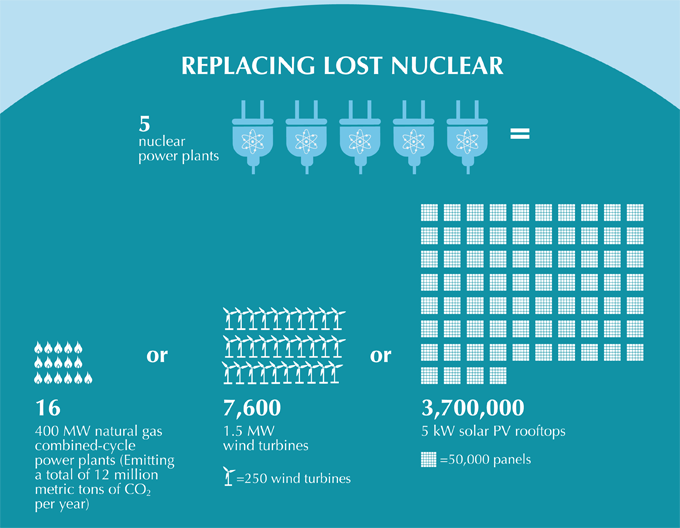 This graphic shows what would be needed to replace the generating capacity of five nuclear plants. Click on the image to see the entire infographic. But wind and solar provide power intermittently, only when the wind blows or the sun shines. Only power sources that are available around-the-clock, known as baseload power, can reliably meet minimum levels of energy demand. Today, baseload power comes from nuclear, coal, and natural gas, as well as biomass and hydropower. Since large-scale energy storage is several years away from commercial viability, intermittent sources like wind and solar, while important for the generation mix, cannot currently be relied on for baseload power. The United States has 100 operating nuclear reactors. The average age of the fleet is 34 years. With the necessary maintenance, most reactors should be able to continue providing power for two decades or more. However, these reactors may not be able to operate until the end of their useful life due to an array of market and policy challenges. Lower natural gas prices and increases in wind power generation – both of which have positive climate benefits – contribute to lower wholesale market prices, which determine merchant nuclear generators’ revenue. (Around half the nuclear fleet operates as merchant generators, i.e. not funded by ratepayers.) Wholesale power markets are also technology-agnostic, and do not value zero-carbon or baseload sources more highly than their alternatives. Meanwhile, life-extending capital investments and mandated post-Fukushima safety enhancements are adding to nuclear power plant costs. Together, these forces are challenging the economic viability of some nuclear power plants. Depressed power prices, higher operating costs and power market design challenges were among the reasons cited for the early retirement of the Kewaunee (Wisconsin) nuclear power station (May 2013) and the Vermont Yankee nuclear power station (Fall 2014). It is important to note that the remaining reactor retirements at San Onofre and Crystal River were the result of maintenance issues, which is an additional factor that can affect the lifespan of nuclear power reactors. C2ES will be exploring potential ways to address these challenges during an April 28 discussion at the National Press Club. Safety, waste, and proliferation concerns are important in considering the future of nuclear power. But we also should consider how further loss of baseload nuclear generating capacity could impact electric system reliability and result in increased carbon emissions. Each nuclear retirement makes it more difficult to achieve the U.S. pledge to reduce emissions 17 percent below 2005 levels by 2020, and to achieve the even greater reductions necessary over the longer term to avoid the worst effects of climate change.